Tutis Group is an engineering, and service company providing solutions’ based intelligent security system designs and installations. We provide a one stop shop for design, installation, integration, and maintenance of security products and systems to a diverse group of end-users. 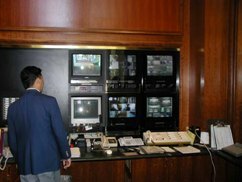 We specialize in the design, engineering, installation and final deployment of access control, intrusion detection, CCTV surveillance, emergency call, patient wandering, and infant protection systems. Tutis is a Licensed California C-7 Contractors. At Tutis Group we strive to make system installation seamless to our clients with end-to-end sales, construction, testing and commissioning, and follow-up service. We specialize in the installation of Communication and Security Systems for Healthcare in Acute Care, Hospitals, Long Term Care Communities, and Assisted Living Facilities. We provide professional installation of Infant Security Systems, Pediatric Security and Safety Systems, Patient Wandering Systems, Patient Monitoring Systems for Dementia and Alzheimer’s Disease , Wireless Nurse Call Systems, Wired Nurse Call Systems, and Real Time Locating Systems (RTLS). Our Kinder Guard infant Security System is the Next Generation of Infant Security Technology. We deploy both Wired and Wireless Nurse Call Systems’ installation and service from our own to any manufacture. We service all brands such as Hug’s Infant Security®, KinderGUARD®, Wanderguard®, SafePlace®, Code Alert®, Vision Link®, SecureCare® and more. Since our inception in 1996 we have taken a great deal of pride in our ability to deliver the highest quality designs, equipment, and system installations. Together with our superior technological know-how, system installation and service, we have gained an excellent reputation and an impressive customer list. We look forward to putting our combined knowledge and experience to work for you.